Jibade-Khalil Huffman is the author three books of poems, including, most recently, Sleeper Hold (Fence, 2015). 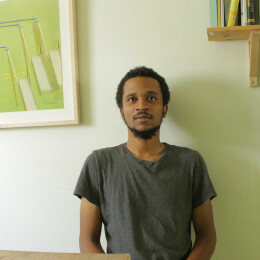 Huffman was an artist-in-residence at The Studio Museum in Harlem in 2015-16 and was included in the 2014 Made in L.A. Biennial at the Hammer Museum. He has presented work at institutions including MoMA/PS1, New York; MOCA, Los Angeles; Swiss Institute, New York and the Portland Institute for Contemporary Art, Portland, Downstairs Projects, ICA Philadelphia and MOCA Detroit. Huffman has exhibited work in solo and group shows at galleries including Anat Ebgi, Los Angeles; Blum & Poe, Los Angeles; LACE, Los Angeles; LAXART, Los Angeles; Marianne Boesky East, New York; China Art Objects, Los Angeles and Night Gallery, Los Angeles.